A template file consists of a set of attributes that defines a Virtual Machine. Using the command onetemplate create, a template can be registered in OpenNebula to be later instantiated. For compatibility with previous versions, you can also create a new Virtual Machine directly from a template file, using the onevm create command. There are some template attributes that can compromise the security of the system or the security of other VMs, and can be used only by users in the oneadmin group. These attributes can be configured in oned.conf, the default ones are labeled with * in the following tables. See the complete list in the Restricted Attributes section. If not explicitly stated, the described attributes are valid for all supported hypervisors. Anything behind the pound or hash sign # is a comment. Strings are delimited with double quotes ", if a double quote is part of the string it needs to be escaped \\". Vector Attributes must contain at least one value. Attribute names are case insensitive, in fact the names are converted to uppercase internally. The following attributes can be defined to specify the capacity of a VM. The following attributes can be defined to set the cost of a VM. Read the showback documentation for more information. (!!) Use one of KERNEL_DS or KERNEL (and INITRD or INITRD_DS). $FILE[IMAGE=<image name>, <IMAGE_UNAME|IMAGE_UID>=<owner name|owner id>], to select images owned by other users, by user name or uid. This section (CPU_MODEL) configures the hardware configuration of the CPU exposed to the guest. This section configures the features enabled for the VM. Persistent disks, uses an Image registered in a Datastore mark as persistent. Clone disks, uses an Image registered in a Datastore. Changes to the images will be discarded. A clone disk can be saved as other image. The rest of DATABLOCK and OS Images, and Volatile disks. Please visit the guide for managing images and the image template reference to learn more about the different image types. You can find a complete description of the contextualization features in the contextualization guide. The default device prefix sd can be changed to hd or other prefix that suits your virtualization hypervisor requirements. You can find more information in the daemon configuration guide. # First DATABLOCK image, mapped to sdb. # Use the Image named Data, owned by the user named oneadmin. # Use the Image named Results owned by user with ID 7. # Use the Image named Experiments owned by user instantiating the VM. Because this VM did not declare a CONTEXT or any disk using a CDROM Image, the first DATABLOCK found is placed right after the OS Image, in sdb. For more information on image management and moving please check the Storage guide. The PORTS and ICMP attributes require the firewalling functionality to be configured. Please read the firewall configuration guide. For more information on setting up virtual networks please check the Managing Virtual Networks guide. You can define a NIC_DEFAULT attribute with values that will be copied to each new NIC. This is specially useful for an administrator to define configuration parameters, such as MODEL, that final users may not be aware of. LISTEN: IP to listen on. For KVM hypervisor the port number is a real one, not the VNC port. So for VNC port 0 you should specify 5900, for port 1 is 5901 and so on. OpenNebula will prevent VNC port collision within a cluster to ensure that a VM can be deployed or migrated to any host in the selected cluster. If the selected port is in use the VM deployment will fail. If the user does not specify the port variable, OpenNebula will try to assign VNC_PORTS[START] + VMID, or the first lower available port. The VNC_PORTS[START] is specified inside the oned.conf file. Note the hypervisor column states that the attribute is Optional, - not supported for that hypervisor or only valid for Linux guests. Limitations apply in vCenter alias for attach/detach nic operations. If more than one of the password changing attributes listed above is defined, only the one with highest priority will be applied. The priority is the same as the order of appearance in this table. The network MUST be in used by any of the NICs defined in the template. The vnet_attribute can be TEMPLATE to include the whole vnet template in XML (base64 encoded). The image MUST be in used by any of the DISKs defined in the template. The image_attribute can be TEMPLATE to include the whole image template in XML (base64 encoded). The user_attribute can be TEMPLATE to include the whole user template in XML (base64 encoded). SCHED_REQUIREMENTS Boolean expression that rules out provisioning hosts from list of machines suitable to run this VM. SCHED_RANK This field sets which attribute will be used to sort the suitable hosts for this VM. Basically, it defines which hosts are more suitable than others. SCHED_DS_REQUIREMENTS Boolean expression that rules out entries from the pool of datastores suitable to run this VM. SCHED_DS_RANK States which attribute will be used to sort the suitable datastores for this VM. Basically, it defines which datastores are more suitable than others. USER_PRIORITY Alter the standard FIFO ordering to dispatch VMs. VMs with a higher USER_PRIORITY will be dispatched first. SCHED_REQUIREMENTS    = "CPUSPEED > 1000"
Each expression is evaluated to 1 (TRUE) or 0 (FALSE). Only those hosts for which the requirement expression is evaluated to TRUE will be considered to run the VM. Logical operators work as expected ( less ‘<’, greater ‘>’, ‘&’ AND, ‘|’ OR, ‘!’ NOT), ‘=’ means equals with numbers (floats and integers). When you use ‘=’ operator with strings, it performs a shell wildcard pattern matching. Additionally the ‘@>’ operator means contains, if the variable evaluates to an array the expression will be true if that array contains the given number or string (or any string that matches the provided pattern). Any variable included in the Host template or its Cluster template can be used in the requirements. You may also use an XPath expression to refer to the attribute. SCHED_REQUIREMENTS = "NAME = \"aquila*\""
SCHED_REQUIREMENTS = "FREE_CPU > 60"
SCHED_REQUIREMENTS = "CURRENT_VMS = 5"
SCHED_REQUIREMENTS = "\"HOST/VMS/ID\" @> 5"
SCHED_REQUIREMENTS = "(CURRENT_VMS != 5) & (CURRENT_VMS != 7)"
SCHED_DS_REQUIREMENTS = "\"CLUSTERS/ID\" @> 101"
If using OpenNebula’s default match-making scheduler in a hypervisor heterogeneous environment, it is a good idea to add an extra line like the following to the VM template to ensure its placement in a specific hypervisor. Template variables can be used in the SCHED_REQUIREMENTS section. $<template_variable>: any single value variable of the VM template. $<template_variable>[<attribute>]: Any single value contained in a multiple value variable in the VM template. $<template_variable>[<attribute>, <attribute2>=<value2>]: Any single value contained in a multiple value variable in the VM template, setting one atribute to discern between multiple variables called the same way. For example, if you have a custom probe that generates a MACS attribute for the hosts, you can do short of a MAC pinning, so only VMs with a given MAC runs in a given host. Rank expressions are evaluated using each host information. ‘+’, ‘-‘, ‘*’, ‘/’ and ‘-‘ are arithmetic operators. The rank expression is calculated using floating point arithmetics, and then round to an integer value. The rank expression is evaluated for each host, those hosts with a higher rank are used first to start the VM. The rank policy must be implemented by the scheduler. 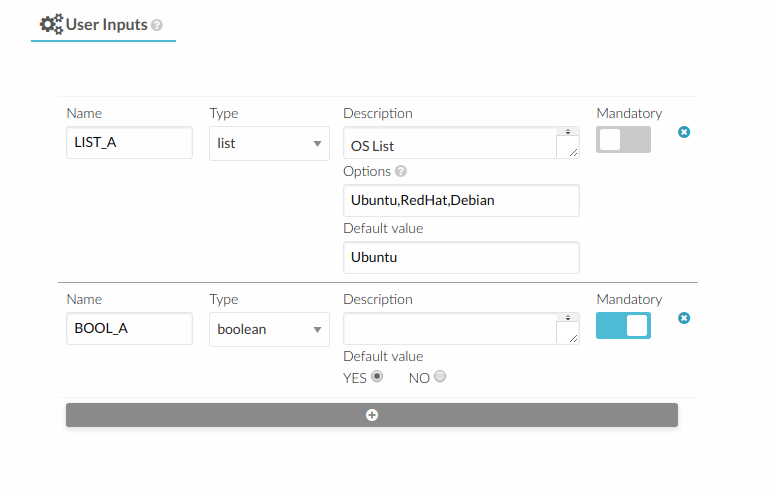 Check the configuration guide to configure the scheduler. SCHED_RANK = "FREE_CPU * 100 - TEMPERATURE"
MAX_CPU Total CPU in the host, in (# cores * 100). CPU_USAGE Allocated used CPU in (# cores * 100). This value is the sum of all the CPU requested by VMs running on the host, and is updated instantly each time a VM is deployed or undeployed. FREE_CPU Real free CPU in (# cores * 100), as returned by the probes. This value is updated each monitorization cycle. USED_CPU Real used CPU in (# cores * 100), as returned by the probes. USED_CPU = MAX_CPU - FREE_CPU. This value is updated each monitorization cycle. MAX_MEM Total memory in the host, in KB. MEM_USAGE Allocated used memory in KB. This value is the sum of all the memory requested by VMs running on the host, and is updated instantly each time a VM is deployed or undeployed. FREE_MEM Real free memory in KB, as returned by the probes. This value is updated each monitorization cycle. USED_MEM Real used memory in KB, as returned by the probes. USED_MEM = MAX_MEM - FREE_MEM. This value is updated each monitorization cycle. RUNNING_VMS Number of VMs deployed on this host. You can execute onehost show <id> -x to see all the attributes and their values. Check the Monitoring Subsystem guide to find out how to extend the information model and add any information probe to the Hosts. You can also tune several low-level hypervisor attributes. The RAW attribute (optional) section of the VM template is used pass VM information directly to the underlying hypervisor. Anything placed in the data attribute gets passed straight to the hypervisor unmodified. data = "<devices><serial type=\"pty\"><source path=\"/dev/pts/5\"/><target port=\"0\"/></serial><console type=\"pty\" tty=\"/dev/pts/5\"><source path=\"/dev/pts/5\"/><target port=\"0\"/></console></devices>"
These attributes can be configured in oned.conf. USER_INPUTS provides the template creator with the possibility to dynamically ask the user instantiating the template for dynamic values that must be defined. Note that the CONTEXT references the variables defined in the USER_INPUTS so the value is injected into the VM. In Sunstone, the USER_INPUTS can be ordered with the mouse. The following attributes can use to define puntual or relative actions for the VM. TIME Time in seconds to start the action. REPEAT Define the granularity of the action [ WEEKLY = 0 , MONTHLY = 1 , YEARLY = 2 , HOURLY = 3 ]. ACTION The action that will be executed. END_TYPE When the users want end the action [ NEVER = 0 , NUMBER OF REPETITIONS = 1 , DATE = 2 ]. END_VALUE The value for END_TYPE attribute, can be a number or a date.